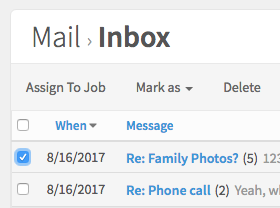 If you imported an email and then assigned it to a job but realized that you assigned it to the wrong one, no problem! You can reassign it from the email list using the bulk actions. Simply find the email in your inbox and check the checkbox to the left. The search bar will turn into action buttons where you can click on 'Assign to Job'. From the assignment page, you can search for and select a different job and hit 'Save & Continue.